One of the most formal and demanding genres of dance, ballet has enthralled audiences with its grace, precision, and remarkable feats of dexterity. Its early roots can be traced back to the 16th century, when court dances were performed for Italian and French royalty. After spreading throughout Europe, ballet flourished in 19th-century Russia, the home of some of the world's greatest dancers and choreographers. Once these dancers traveled to America in the 20th century, ballet began to evolve as the style came in contact with the burgeoning modern dance movement. 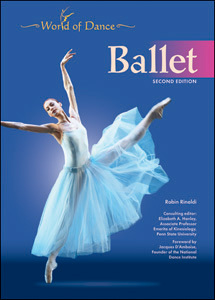 In this revised edition of Ballet, readers will learn how this precise dance form has evolved throughout the centuries through colorful photographs and illustrations and engaging text. Full-color photographs. Sidebars. References. Glossary. Further reading. Web sites. Index. Robin Rinaldi has written about dance for several publications, including the Sacramento News & Review and Philadelphia Weekly, and interviewed such choreographers as Mark Morris, Ron Cunningham, David Parsons, and Judith Jamison, among others. She lives in San Francisco, where she is currently the executive editor at 7x7 magazine. She is also the author of European Dance: Ireland, Poland, Spain, and Greece, Second Edition, another title in the revised Chelsea House series World of Dance.